Caroline is a wonderful, sweet human, but, Hercules realizes, she has horrible taste in men. Her boyfriend Thomas is a jerk, and he hates dogs, so Hercules decide to find her a new, more suitable mate. He is aided by Mr. Beck, an old, fat cat and expert in human behaviour. ‘I don’t believe,’ I retort with as much dignity as I can muster under these adverse circumstances, ‘that this establishment takes reservations. I was here before you, so I will lie down on this spot. Kindly allow me to do so.’ […] He has surely never encountered such civil resistance. I stretch out contentedly. It’s the dignity part that got me. I couldn’t help but picture this cuddly little dachshund with his nose in the air like the butler Stevens from Remains of the Day. Go Hercules go! The novel falters a bit for me in the latter scenes where Hercules and Mr. Beck scheme to find Caroline a man. They are certainly comic, but at times, felt a bit repetitive — how many times can Hercules conceivably pull off the same trick without people, especially Caroline, becoming seriously concerned? That being said, even those moments are charming — they work for the simple reason that you are already in love with Hercules, and with Caroline, and you genuinely care about both finding happiness. “Natural” is a strange word to use for a book about a dog playing matchmaker, but my favourite parts in the novel do feel natural. They feel real. When Hercules first meets Caroline and loves her scent “like a beautiful summer’s day,” for example, or any of the scenes with Caroline’s business partner, friend and potential love interest Daniel — they feel warm and comfortable. Caroline’s romantic adventures are interesting to read from Hercules’ point of view. He usually has no clue what Caroline is thinking, and is surprised that his plans haven’t worked out like he thought. Personally, I was totally rooting for one of the men, and felt disappointed by the ending. I was also disappointed with the way Scheunemann ended one of Caroline’s relationships near the end; it just felt too convenient. That being said, Puppy Love was a lot of fun to read. I’d love a dog like Hercules — seriously, look at that cover. How can you resist those puppy dog eyes? 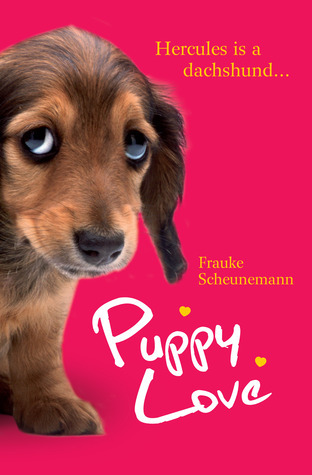 Puppy Love is a warm, wonderful, charming book to enjoy on a lazy weekend or a relaxing day off. This entry was posted in Book Reviews and tagged 50BookPledge2012, Anansi, ARC, Fiction by Jaclyn. Bookmark the permalink.